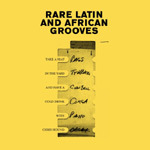 Ultimate connoisseur's compilation of Latin and African gems, covering a spectrum of super rare tracks previously unavailable in a physical format. One hour and 15 minute runtime. Selected and mixed by Chris Hound. The cassette flows with blended, mixtape transitions between songs and features an unprecedented amount of rare tracks within. Chris Hound creates a classic mix tape with tracks that flow effortlessly one after another.